Offering absolute beachfront accommodation surrounded by the headland, ocean and national park, Burleigh Point Holiday Apartments is just metres from the famous ‘Burleigh Barrel’ that attractions surfers from all over the world. Home to a great range of onsite facilities, the resort is close to local shopping, dining, activities and attractions and is just minutes from the Burleigh Heads National Park and Miami Golf Course. The resort is also just a short drive from Surfers Paradise, Jupiter’s Casino and the Gold Coast Airport in Coolangatta. Boasting stunning ocean views, Burleigh Surf Apartments offer self-catering apartment accommodation directly opposite Justin Park. Home to a great range of onsite facilities, the resort is shaded by a canopy of tropical pine trees and is just a short stroll from a surf club, children’s playground, public transport, shopping, dining, activities and attractions including the Burleigh Heads National Park. 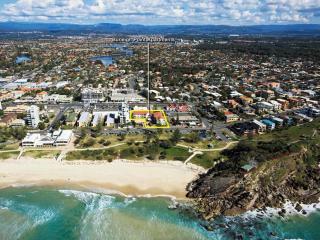 The resort is also just 15 minutes from the Gold Coast Airport. Located just minutes from the Burleigh Heads National Park, Grande Florida Beachside Resort offers self contained, spacious 1, 2 and 3 bedroom apartments a short stroll from Miami Beach. Home to a great range of onsite facilities, the resort enjoys lush gardens and a tropical atmosphere and is close to a range of local shopping, dining, entertainment, activities and attractions. The resort is also just 10 minutes from Broadbeach, 20 minutes from the Gold Coast Airport in Coolangatta and 30 minutes from the famous Gold Coast theme parks. Centrally located just a short stroll from Burleigh Beach, Outrigger Burleigh offers hotel and apartment accommodation surrounded by the region’s best shopping, dining, entertainment, activities and attractions. Home to a convenient range of onsite facilities, the resort is within minutes of popular patrolled beaches, the esplanade, playgrounds, markets and a huge range of recreational activities as well as the Casino, Surfers Paradise, Pacific Fair Shopping Centre and the Gold Coast Airport. Ideally located on the Gold Coast Highway, Sunshine Beach Resort offers well-appointed accommodation conveniently close to the surfing hotspot of Burleigh Beach. Home to a great range of onsite facilities, the resort is just 300 metres from the beach, is close to public transport and is within walking distance of the North Burleigh Surf Club. Close to shopping, dining, activities and attractions, the resort is just a short stroll from the Esplanade and the famous live music venue of the Miami Tavern.